Authors: Tabetha S. Boyajian et al. 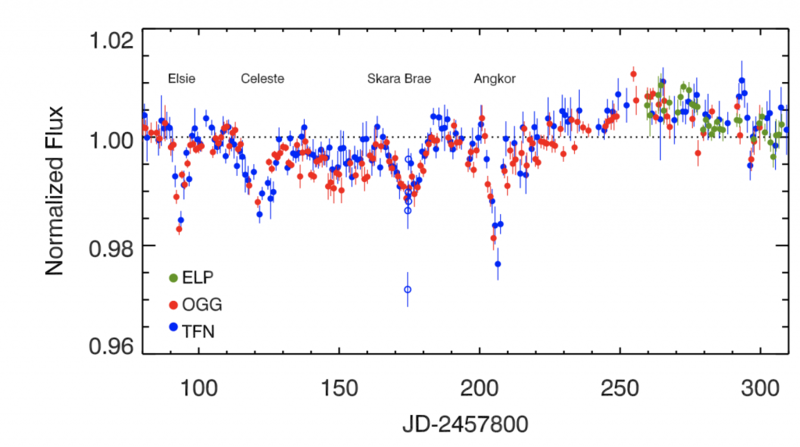 That dimming turned out to be the first night of a very interesting summer for Boyajian’s Star. Since May, the star has dimmed four separate times. In today’s paper, Dr. Boyajian presents the new data, and offers, for the first time, a hint at a solution to the mystery. Figure 1. The four dimming events of May-September 2017, named the “Elsie family.” The y-axis represents the amount of light coming from Boyajian’s Star relative to its ordinary state, and the x-axis represents time in days. Each color represents a different telescope in the Las Cumbres network–their Texas observatory, in green, came online in November 2017. The first thing to notice about the four dips of the Elsie family are their wonderful names. “Elsie” comes from the initials “L.C.” of “light curve.” “Celeste” (inspired by the initials “C.L.”) is so named because it’s Elsie’s opposite–instead of dimming rapidly and then brightening slowly, it dimmed slowly and brightened quickly. “Skara Brae” is named after a neolithic town in Scotland, unexpectedly unearthed by a passing storm; “Angkor” after the great abandoned Cambodian city, obscured by forest for hundreds of years, but ultimately uncovered. It’s a mark of the exceptional and inspiring level of public engagement in this research that these events were named at all, let alone so loftily–most astronomers are happy to stick with catalog numbers and Julian dates. (The dimming events observed in Boyajian’s Star during the Kepler mission were given names like D1540, for comparison.) But this project owes everything to its citizen scientists. Not only did they discover the star in the first place, but they also crowd-funded the Las Cumbres observations that revealed the Elsie family. The second thing to notice is that all four dips are of similar depth (the star dims to ~98% of its ordinary brightness), but drastically different shapes. 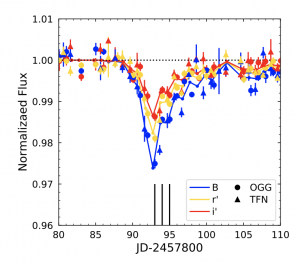 In other words, Boyajian’s Star looks no more like a regular old exoplanet-hosting star than it did at the end of the Kepler mission, four years ago. Skara Brae bears some resemblance to one of the dips observed by Kepler, but we won’t know if it’s truly a repeat of that earlier dip until we’ve watched it for much longer and looked for further repeats. Figure 2. The “Elsie” event as observed in bandpasses of three different colors, by two of the Las Cumbres telescopes (plotted as circles and triangles, respectively). Elsie is deepest in the B band (the bluest of the three bands) and shallowest in the i’ band (the reddest of the three). The dependence of the dimming on color suggests that circumstellar dust is responsible for the dip. Elsie is deeper in the blue than it is in the red! From that, we can deduce that whatever is blocking the light from Boyajian’s Star is less amenable to letting blue light through than red. It’s tough to explain that behavior with an opaque object, like a planet, transiting in front of the star–rather, Dr. Boyajian and her team argue, it’s more likely that clouds of dust grains, smaller than a micrometer across, are responsible. Think of such grains as tiny glass spheres eclipsing the star, refracting starlight off its original course, scattering away short blue wavelengths and leaving longer red wavelengths less affected. Of course, these dust grains still have to come from somewhere, and that’s an entirely new puzzle. Micrometer-sized grains are so small that they get pushed around–or, more accurately, away–by starlight itself. If dust is the answer, it must be continuously resupplied or created around Boyajian’s Star. Dusty comets, planetesimals, or collisions between such objects are one possible source of dust, so the exo-comet hypothesis (Dr. Boyajian’s original explanation for the Kepler dips!) might be back in play. Luckily, analysis of the colors of the other three dips is in the works, and Las Cumbres is still looking. Stay tuned!